I just happened to stop by G-Lo’s one day (truth be told, it may have been more of a planned session than just stopping over and I may have had a bottle or two under each arm but I digress) and never a poor host, he offered up a bottle of the Dead Reckoning Porter from Tröegs Brewing Company. Tröegs is a microbrewery located in Hershey, PA that was founded in 1997 by brothers, Chris and John Trogner. They produce 6 year round beers, around 4 seasonal beers and an anniversary beer. In the 14th century, sailors would rely on sheer skill to get from a starting point to a final destination. They called this Dead Reckoning. We see our beer the same way. We know where to begin and know where to go, but there are hundreds of ways to get there. Unfiltered and aggressively hopped for the style, Dead Reckoning’s flavor originates in the chocolate and roasted malts, then follows through with sharp, earthy bitterness and a rich, smooth cocoa mouthfeel. I found the Dead Reckoning Porter to have the following characteristics. Appearance: Black with a light tan foam and good lacing. Aroma: Sweet, malty with a hint of pine and cocoa. Taste: Thin, refreshing with a slightly bitter, dark chocolate/coffee aftertaste. I find that the Tröegs line-up is a little heavy on the hops and the Dead Reckoning Porter is no exception. It is almost a hybrid between an IPA and a porter, But, I found that the hops and chocolate malt maintained a good balance. While not a porter in a traditional sense, I enjoyed this beer. Monday Morning Craft Beer and Whiskey News! 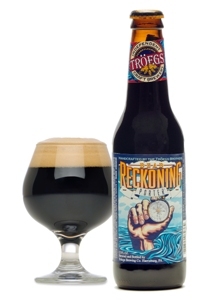 While not a traditional porter, the Dead Reckoning is certainly worth a try. I’m a big fan of hops, so I definitely need to track this one down… Nice review!